For the 22nd year, Maritime Gallery artists will congregate at The Maritime Gallery at Mystic Seaport to paint the Museum grounds and environs. 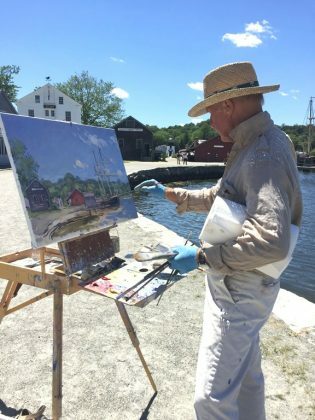 Following the tradition of the plein air painters of the 19th and early 20th centuries, artists can be found at their French easels on the grounds of Mystic Seaport capturing the shifting light along the Mystic River and also nearby at coastal marshes and beaches. Come and watch your favorite artists paint en plein air beginning Tuesday, June 12 and continuing through Saturday, June 16. There will be a public opening reception at The Maritime Gallery on Saturday, June 16 from 5:30 to 7 p.m. Meet the artists and purchase works fresh from the easel. Refreshments will be served.